Hi! No news here for a while - I've been occupied with things in real life. I managed to find a new apartment! It's about a 10 minute walk further west from work from where I currently am, making for a total walk of 20 minutes. It's closer to the park where I like to jog in the warmer months. It's a basement bachelor, but quite pleasant because the apartment was renovated a few months ago so everything is clean and new. There aren't any windows but there are frosted glass double doors which let in lots of light. Even the subterranean entrance has been re-done in modern style and there could be room for potted plants and a garden chair. It's on a quieter street than my place now, but it's in the same neighborhood so I don't have to change gyms or start taking transit to the office. I think it will be a good place to live. Plus, I was chosen out of a group of applicants so it's great that the landlord has decided I'm likable right from the start. I can't quite tell if the living area is smaller, the same size or larger when compared to my current apartment. I'm going from a place with a hall, a galley kitchen and a main room into an open concept space, so it's tough to judge. I do know that the kitchen (which actually has counter space, hurrah!) has more storage than my current kitchen, but there is far less storage for clothes and shoes. This will be tricky because I have a huge amount of clothing. Now, I'm working on sorting out clothes to get rid of what I don't wear. There are clothes that are out of fashion, clothes that are no longer my style and clothes that don't fit since my big, lingering Turning 30 weight bump. 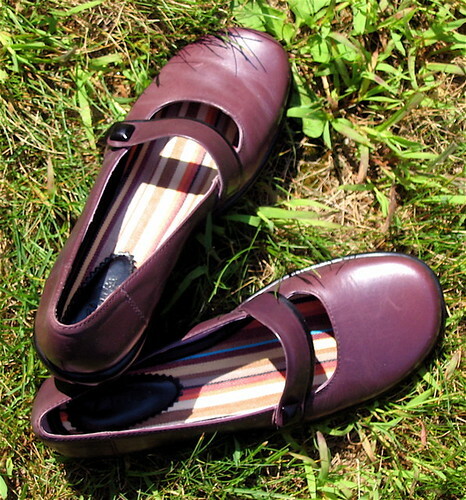 Some of these items are in very good nick and are maybe a little too nice to be donated straight to one of the charities that collects old clothes (e.g.the cute shoes shown below that I never wear, size 7 - want them?) I'm wondering about having a 'porch sale' of stuff I no longer need or whether that's a waste of time and I should just donate everything without any fuss. They are very nice cute shoes Andrea! We are going to Japan soon yay! I regularly donate to the Salvation Army or put a bag out on the street labelled FREE. You can also work with a consignment store to sell your items as you probably wont make much from a yard sale. You can donate your things to a theatre too. But I really suggest revamping your old clothes, tune into 'GOKS FASHION FIX' on the W Network for inspiration, he's amazing! Any old shoes can be donated to the 'RON WHITE' store where he fixes them and donates them to charity.